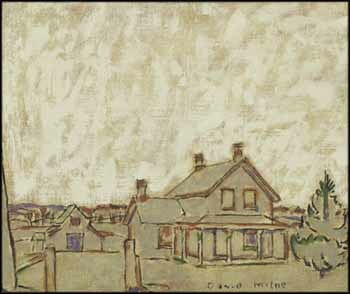 signed and on verso titled on the gallery labels and inscribed "112" / "151A" / "Gray House"
In March of 1930, David Milne and his wife Patsy moved to the rural village of Palgrave, then about 60 kilometres northwest of Toronto, far enough away to provide the solitude Milne craved but close enough for quick access should the need arise. Milne’s prior residence in Boston Corners, outside of New York City, had shaped his preferred list of requirements for a home base. He wanted a garden, a view of rolling hills, access to a larger centre for supplies and through which to ship his works - but above all, peace, quiet, and the right kind of neighbours, meaning those who were interesting but who would largely leave him alone. The house the Milnes moved into had been vacant for some time, and with its small barn, garden plot, fruit trees and currant patch, it satisfied Milne's list. The unobstructed views from the second floor suited him perfectly, and he turned a room there into his studio. The village was laid out compactly, with a railway station, two hotels and a pair of tiny churches. The small flour mill provided some industry, and a doctor and schoolhouse kept the community viable. In addition, there were a few dozen houses, most of which became the focus of Milne’s work at one point or another. At Palgrave, much of his focus was on Ollie Matson’s house, immediately across the street from his own, and which Milne could observe daily from his studio window. Here we see Matson’s house on a dull day, when the sky is cast in white and the house and town are cast in grey. The limited and unmixed palette - green, grey, purple, sienna, and of course black and white - provide an astonishing amount of detail. Milne has relied on variations in brushwork to give us his image, so that paint patterning and the outlining of his subject are the bones of the work. It is in these things that Milne’s artistry lies. A line of sienna paint differs from a blotch of the same colour, which differs again from a hint of this same sienna almost lost in the clouds. Simplicity, as summed up by the old adage “Less is more,” is exemplified by Milne and expertly proven in this beautifully understated work. Milne painted more than a dozen views of Matson’s house, including The House Is a Square Red Cloud, now in the collection of the National Gallery of Canada. In them, Milne experiments. He uses a small number of colours, shifts the compositional focus and investigates the possibilities of a tranquil, empty sky over a cloud-filled one. He was particularly interested in exploring different methods to convey a sense of simplicity in his work. By painting more than half of this canvas in a patchy, consistently applied flat white, here he has achieved a sense of quiet serenity, where the sky takes centre stage over the house and outbuildings. The relationship of negative and positive space in Milne's work is often masterful, as it is in Gray House, Palgrave, Ontario, where the two are in balance, and where each is equally key to how we are able to read the work. Milne was buoyed and optimistic while living in Palgrave, happy with the results of his work. The three years he spent there were among the most productive and intellectually satisfying in his painting life. He executed over 200 paintings, and in them he explored in depth many of his questions about spatial structure, composition, saturation and colour value. In Gray House, Palgrave, Ontario, we find these questions satisfyingly answered. On verso is an image of houses underneath a semi-transparent white ground.